As part of its commitment to build a Weather-Ready Nation, the Commerce Department’s National Oceanic and Atmospheric Administration (NOAA) launched the Weather-Ready Nation Ambassador initiative last month. NOAA’s National Weather Service is recognizing the first 100 Ambassadors during National Severe Weather Preparedness Week, March 2 to 8. NOAA urges more businesses and organizations to join the group of Ambassadors in working with NOAA to strengthen national resilience in the face of extreme weather. Among the new Ambassadors are weather industry partners, including AccuWeather, Raytheon, The Weather Channel and Vaisala, along with businesses, nonprofits, universities, and other organizations. These organizations bring a wide range of expertise, from community preparedness and safety to supercomputing and observations. One Ambassador with recent weather-ready experience is the Moore Medical Center in Oklahoma. On May 20, 2013, an EF-5 tornado struck the Center. Fortunately, the hospital staff had a well-practiced emergency plan and carefully monitored the National Weather Service forecast that day. When a tornado warning was issued, staff quickly relocated patients and others to windowless safe areas and used mattresses and blankets to protect them from flying debris. Damage to the hospital was extensive, but no lives were lost. More than 300 individuals who were at the center that day survived, due in large part to the planning and actions of the hospital administration and staff. 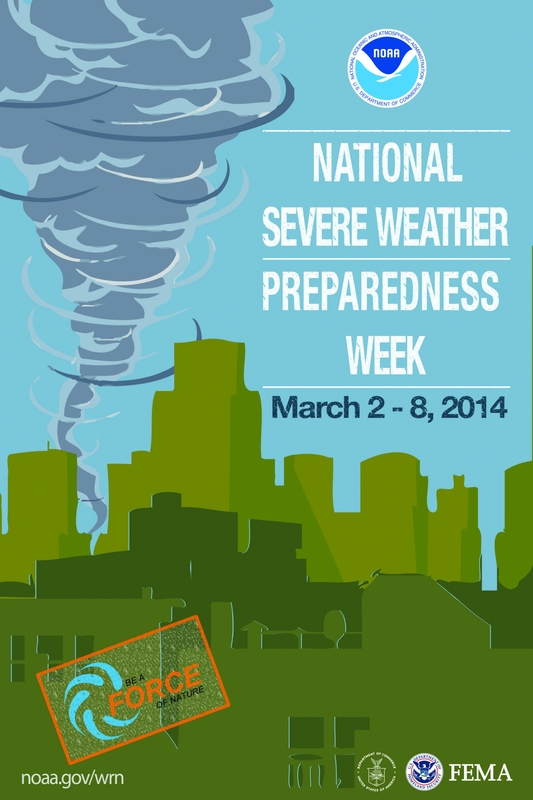 NOAA and the Federal Emergency Management Agency (FEMA) have partnered again this year for National Severe Weather Preparedness Week. Severe weather is far more common than most realize. The five most dangerous severe weather hazards -- tornadoes, hurricanes, lightning, floods and winter storms, can be powerful and damaging. While spring is considered the height of season, severe weather occurs in every month of the year and in all 50 states. In 2012, there were more than 450 weather related fatalities and more than 2,600 injuries. Know Your Risk: The first step to becoming weather-ready is to understand the type of hazardous weather that can affect where you live and work, and how the weather could impact you and your family. Every state in the United States has experienced tornadoes and severe weather, so everyone is exposed to some degree of risk. Check the weather forecast regularly and visitReady.gov/severeweather to learn more about how to be better prepared and how you can protect your family when severe weather strikes. Take Action, Pledge to Prepare: Be a Force of Nature by making sure that you and your family are prepared for severe weather. Pledge to prepare at Ready.gov. Fill out your family communications plan that you can email to yourself, put together an emergency kit, and keep important papers and valuables in a safe place. Stay informed by having multiple sources for weather alerts such as a NOAA Weather Radio, Weather.gov, and Wireless Emergency Alerts. 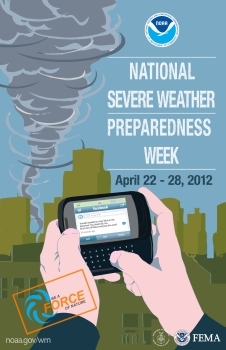 And, sign up for localized alerts from emergency management officials. Be an example: Once you have taken action Be a Force of Nature by telling family, friends, and co-workers to do the same. Share the resources and alert systems you discovered through your social media network. Create a preparedness video and post on a video sharing site; post your story through your social media network and comment on a blog. Technology today makes it easier than ever to be a good example and share the steps you took to help us achieve the vision of a Weather-Ready Nation. The first-ever National Severe Weather Preparedness Week begins Sunday, April 22, and Commerce's National Oceanic and Atmospheric Administration (NOAA) and the Federal Emergency Management Agency (FEMA) have partnered to raise awareness and save lives. Last year, storms raked the central and southern United States, spawning more than 300 tornadoes, claiming hundreds of lives and ranking as one of the largest tornado outbreaks in U.S. history. As the nation marks the first anniversary of that historic outbreak, from April 22-28 we’re asking each person across the country to “Be a Force of Nature” by knowing the risk, taking action and being an example. Starting April 22, visit the NOAA homepage, National Weather Service Weather-Ready Nation website and the NOAA and NWS Facebook pages to get daily tips on how you can become a force of nature. The severe weather of 2012 has already brought to light many forces of nature across the country. There was Stephanie Decker in Indiana, who, after receiving a timely text from her husband about an imminent tornado, took immediate action and gathered her children in the basement. Shielding them from collapsing debris, Stephanie tragically lost parts of both of her legs, but her children were unharmed. Lisa Rebstock in Texas saved the lives of her children by being prepared with a plan and a kit before the storm struck. Eighty-eight-year-old Wilma Nelson survived the deadliest tornado in Oklahoma history in 1947 and proved her force of nature status yet again. She said she owes her life to a NOAA Weather Radio that alerted her of the tornado that struck Woodward, Oklahoma, April 15.